Reports of Investigations (RIs) present the results of original mining health and safety research. They describe individual, short-term studies and include the objective of the research, the materials and techniques used, and the results of tests or experiments. Information Circulars (ICs)present information compiled and analyzed by mining health and safety researchers. 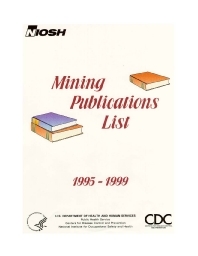 They include historical and statistical data, surveys of mining and operating activities, computer program descriptions and user guides, and annotated bibliographies. Technology News is a one-page flyer used to announce a milestone in mining health and safety research, technology ready for transfer to industry, or an opportunity for cooperative research and development. Mining Health and Safety Focus is a newsletter issued periodically on different topics to apprise readers of tangible research results and to expedite the transfer of new technologies to customers. Each section describes what is new or changed in relation to current practices or technologies in mines today.